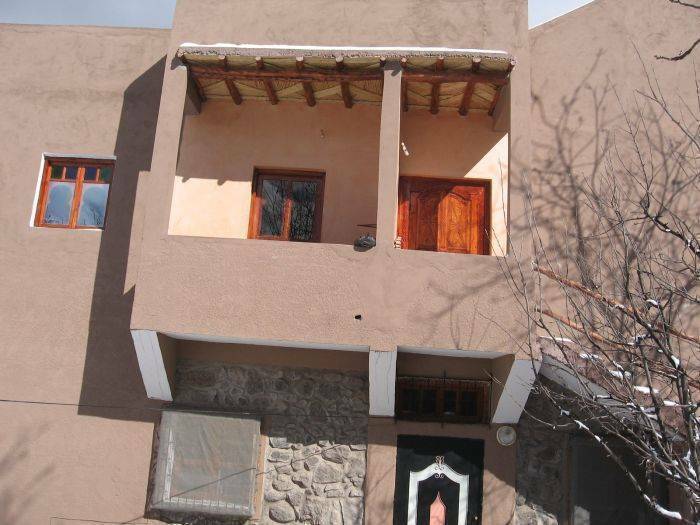 Welcome to Houssine's guests house in Imlil, the start point of most trip towards the High Atlas Mountains in Moroccos including the Toubkal ascent which the highest peak in North Africa. stay 15.06.09 and 17.06.09 ... My reccomendation,clean quite cosy apart. 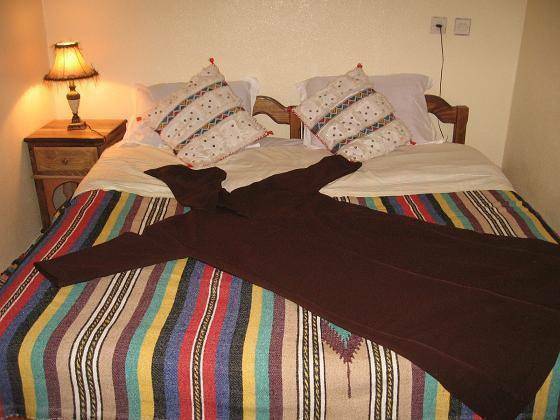 Located in the beautiful village of Imlil, the main gateway for trekking in the Atlas mountains, Houssine's Riad offers you the chance to stay in this lively rural surrounding. Douar ait souka /dar ouassaggou is an ideal place to stay before and / or after one of our hikes and treks in the High Atlas, beforehand it offers some acclimatisation to the altitude and a relaxed start to the day; afterwards it offers a hot shower and a comfy bed without the transfer back to the hustle and bustle of Marrakech. 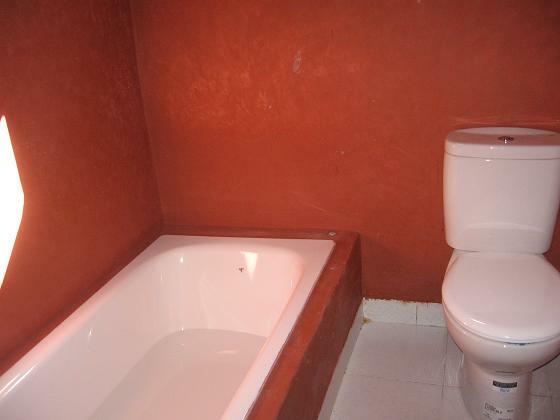 We offer 6 double ensuite rooms with a private shower & wc, 1 large berber salon for relaxation and free time. Our roof terrace enjoys nice views above several berber villages. This is an ideal base for walking and other outdoor activities. Guides, mules and packed lunches can be organized on request. There are also traditional Hammam in village for the perfect way to end the day! The warm and very friendly welcome by Houssine and his team makes this accommodation special. This is an ideal base for walking and other outdoor activities. Guides, mules and packed lunches can be organized on request. The traditional Hammam in village is the perfect way to end the day! You can reach the house just 1h30 drive from Marrakech airport by a private transport arranged normally by Houssine or a public taxi with own arrangement from the airport or the Medina. 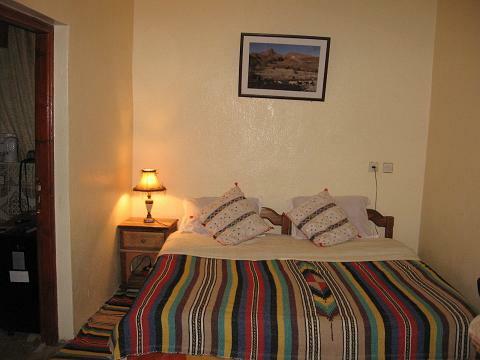 Room double/twin 1: En suite with bath rooms can be set up as twins or doubles and available too for triple CD Player , towels, extra blanket. 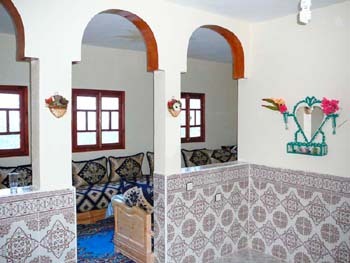 Large Berber salon for relaxation and free time. 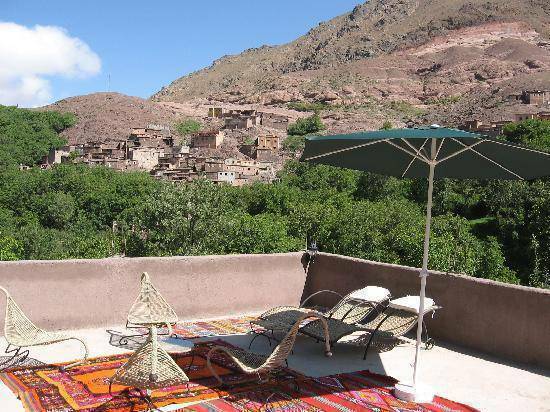 Nice roof terrace which creates fantastic views above several Berber villages. What can we do there? Sit and watch the way of life go by of the Berbers of the High Atlas . A 2 day 1 night expedition to North Africas highest peak Jbel Toubkal . 60km from Marrakech in direction of High Atlas Mountains (Jbel Toubkal 4165 m). From Imlil you take left dirt road direction of Tizi Ntamatert (10mn see map) in face of Douar Ait Souka. Near the road you find guest house Ouassagou.